0 registered (), 12 Guests and 0 Spiders online. Hard to say, I don't have an AI. Got some new starline brass in. 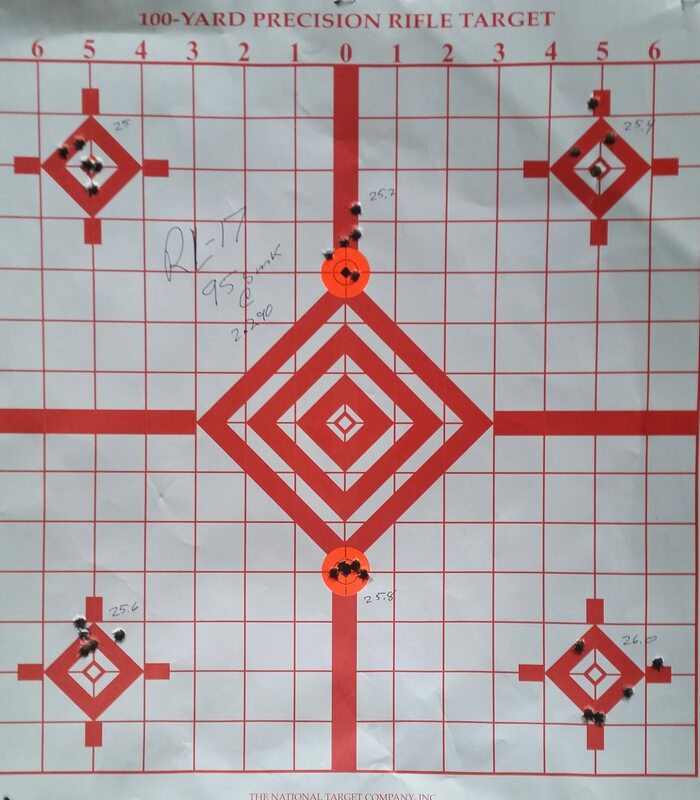 Took 24.4 out for a spin and came up with this with 5 at 100. 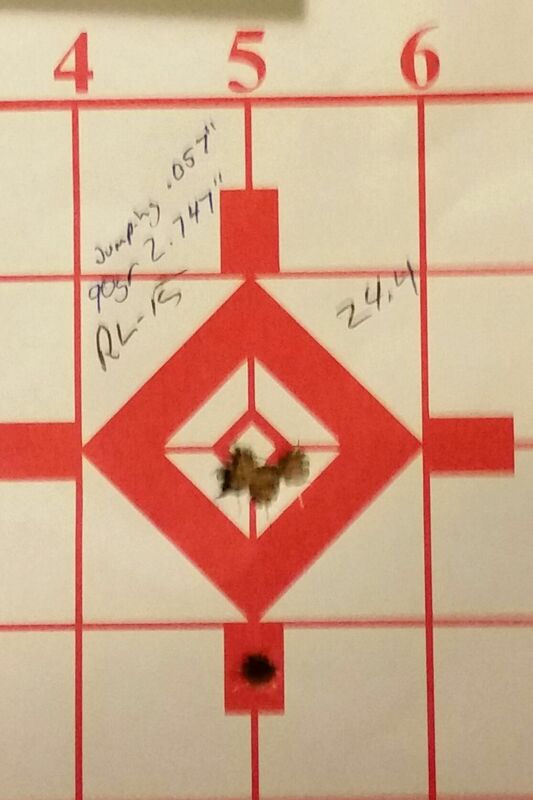 It shot nearly the same at 600... 3 into 1.5" this time with two droping low to make 1 moa total. I'll try it again with once fired now and also 1/10 more and less grain of powder. Velocity testing 95gr SMK loaded to an overall length of 2.290 with RL-17 in new starline brass and CCI #41 primers. two shots each charge weight over a magnetospeed from my 22" Bartlein barrel 6.5twist with rifle +2" gas system smithed by Craddock Precision. I stopped right there as that is a huge jump in velocity. 26 and 26.3 had ever so slight ejector polishing on the case head. One thing to note I was running my gen 1 JP SCS buffer system with the lightest spring weight so switching to the gen2 H2 SCS and or a heavier spring may delay the opening enough to get rid of the slight ejector marks. RL-17 & 95 gr SMK @2.290... going to give 25.6,25.7 and 25.8 another try to confirm. How is this rifle working out for you? For the 22" barrel I've settled on 23.4 grains of Varget under a 88 Hornady 88eld 2.270" OAL in starline brass. That gives me 2648fps and prints into .6-.7" groups at 100 yards. This load has also maintained groups under 3/4 moa on plates at distance consistently. I have how ever had some issues getting enough gas to reliably cycle the action and moved over to a non adjustable gas block and for now that has fixed the issue. Were I to buy this barrel again I'd try my best to get a rifle +1" rather than a rifle +2" gas port. and if that was not possible I'd go with a standard rifle length system. The 95 smk's, IMHO, are not worth messing with... at least not in a AR. I'd love to try them in a bolt action where you could set them out and load hotter. But at least for me in this 22" barrel the velocity I can achieve doesn't make them any better than the 88's. I still think this is a great caliber for the AR and I would still purchase a barrel. Were I to build a bolt rifle I would have a custom chamber reamer made to seat the 88 and 95 out to the usable length of the mags I'd be using. Doing so should allow you to surpass anything the 223AI would be able to do by a bit while having a higher BC bullet. But for the guy that doesn't necessarily want an AR nor fiddle with custom reamers I think the 223AI or even a 223 wylde in a bolt rifle will match what I getting in the Valkyrie. That said the Valkyrie is head and shoulders above a 223 performance in a AR. About 150-200fps with 69 and 77 smk's in the same barrel lengths. But where it really shines is when you use 75, 80 and 88elds that you cant use in a standard 223 AR. Generated in 0.021 seconds in which 0.009 seconds were spent on a total of 15 queries. Zlib compression disabled.